Stems: Erect, stout, single, usually unbranched below inflorescences, nearly glabrous or spreading-hairy, contains milky sap. Leaves: Alternate, simple, sessile, oblong to ovate or elliptic, 1.5 to 4 inches long, .5 to 1.25 inch wide, glabrous or somewhat hairy; margins entire; tips pointed; upper leaves reduced. Inflorescences: Umbel-like clusters of small cup-shaped receptacles, terminal; bracts large, leaf-like, in crowded whorls below inflorescences; margins broad, white. Flowers: Receptacles with 3-5 white petal-like appendages around lip, greenish glands at base of each appendage, containing 1 pistillate flower and 35-60 tiny staminate flowers; petals and sepals absent. Fruits: Capsules, 3-lobed, hairy; seeds 3, egg-shaped, bumpy, dark gray. Habitat: Prairies, roadsides, stream bottoms, and waste areas, most abundant in limestone soils. Toxicity: When damaged, snow-on-the-mountain exudes a milky sap that can cause skin irritation similar to that seen with poison ivy. Cattle normally will not graze snow-on-the-mountain due to its bitter taste, but can become debilitated and even die after eating hay containing it. Comments: A stand of this plant can make the ground appear as if it is covered with snow. 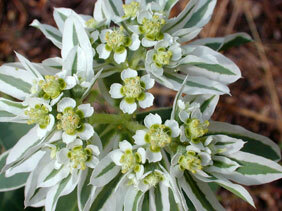 Snow-on-the-mountain is related to the poinsettia (Euphorbia pulcherrima Willd. ).